Dwight describes Larus cachinnans Yellow-legged Gull from p.202-207. Within this form appears to be both Caspian Gull cachinnans and Mediterranean Yellow-legged Gull michahellis as known to today's gull watchers. 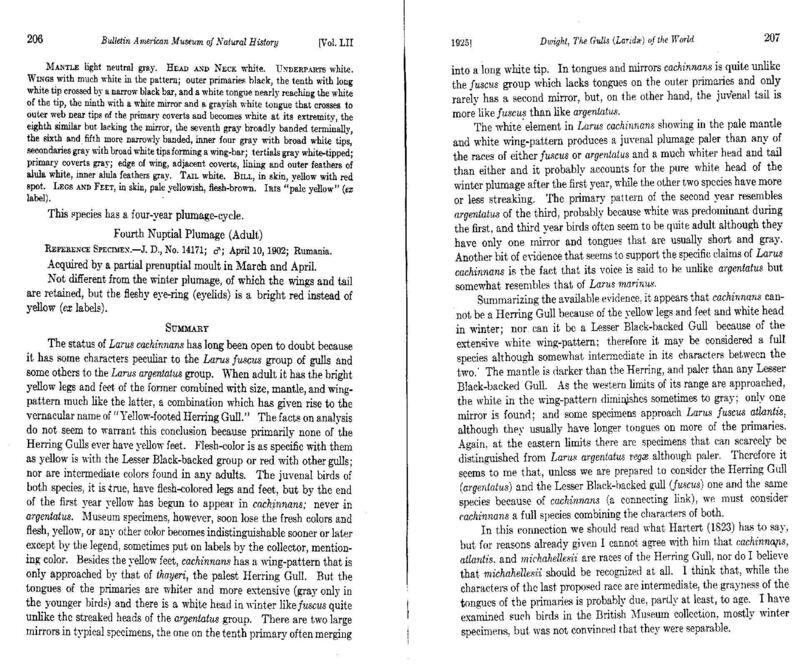 The pages below contain the summary of Dwight's cachinnans. There are two large mirrors [on P9 and P10] in typical specimens. Its voice is unlike argentatus but somewhat resembles that of marinus. It cannot be a Herring Gull because of the yellow legs and feet and white head in winter. It cannot be a Lesser Black-backed Gull because of the extensive white wing pattern. It may therefore be considered a full species although intermediate between the two. Some specimens approach atlantis although they usually have longer [pale] tongues on more of the primaries.